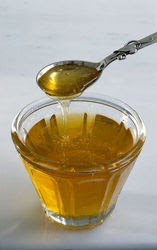 I just learned from a friend that a spoon full of honey grown locally can be used to treat seasonal allergy symptoms. So, I tried eating some two weeks ago and It works for my on and off sniffling and sneezing. I got more curious, so I researched more about this remedy, and this is what I found out, The reason why honey may help with seasonal allergies is because honey contains a bit of pollen from the plants. So if you eat the sweet treat that is made by bees in your area, the honey will often act as a natural vaccination, reducing your allergy symptoms to the local flowering plants and help boost your immune system. For some people eating locally honey works for them, but may not for others. Well, this remedy is just a a folk remedy and has no scientific research to prove, but if you're like me who suffer from seasonal allergies like sniffles and sneezing, it's worth a try. And if it doesn't work for you, well at least you're getting vitamins B6, thiamin, niacin, riboflavin, pantothenic acid and minerals like calcium, copper, iron, magnesium, potassium, and zinc. Honey also contains antioxidants and vitamin C. Plus, it is delicious!